Easter brunch is a tall order. For one, you're combining two meals — all things breakfast, all things lunch — which means you've got to pull off everything from eggs and bacon and OJ to quiches and roasted meats and bubbly booze. For another, Easter eaters are usually only two kinds of people: children jacked up on sugar, and adults weary from hiding eggs and filling baskets. A recent food-blog event, however, suggested an alternative: Open up your kitchen and let everyone help make homemade doughnuts. The Time To Make The Doughnuts Event, held January 15 through February 15, highlighted homemade-doughnut recipes from around the world. 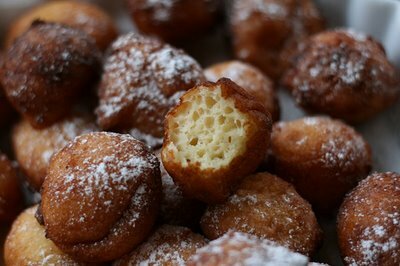 Entries ranged from Estonian curd-cheese doughnuts to Italian zeppole to Mexican sopaipillas. Culinary Concoctions by Peabody showcases a handful of the recipes, and Tartelette features the rest in two posts: First Batch and Second Batch. Sure, after all those chocolate bunnies, maybe nobody wants more sugar. Then again, Easter doughnuts might just become a new tradition.